15% off total bill all day Monday. 15% off Tuesday to Wednesday 11am to 6.30pm and Thursday to Sunday 11am to 4pm, offer not valid on drinks only tables. One card per two diners. 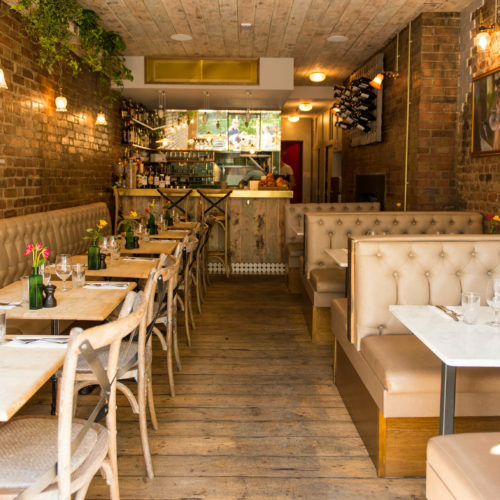 The team behind two of London’s most successful cocktail bars, Happiness Forgets and Original Sin, launched their first restaurant Petit Pois bistro earlier this year. After meeting last year, and sharing a mutual love of classic French food, Alastair Burgess of Happiness Forgets, and Chef Chris Smith, who trained at Le Cordon Bleu Paris and whose career spans Michelin starred restaurants to London street food, set out to open a cosy French bistro in the heart of East London. Petit Pois Bistro offers diners a small menu of uncomplicated French classics seven days a week. Speaking about where the idea came from, Alastair says, “We were tired of all the new restaurants in London being either super fine-dining, or gourmet fast food. We wanted to create somewhere that sat in the middle. People can come here with a reservation and enjoy great food, from real plates, at reasonable prices.” Three courses with wine will set you back no more than £30 per head! Pastries and coffee by Assembly Roasters will be served from 9am, seven days a week. Visitors for lunch or dinner will enjoy comforting classics from the main bistro menu (available from 11am on weekdays) such as moules marinière, steak frites with béarnaise, duck confit with onion purée and gratin dauphinoise. Chocolate mousse is served straight from the bowl at diners’ tables. A small wine list has been carefully curated by Sommelier, Chris Madden (formerly of Social Eating House). Guests can also enjoy drinks from a small cocktail menu created by Alastair himself. Weekend brunch is served from 10am – 3pm, Saturday and Sunday, and features traditional dishes such as croque madame, scrambled eggs on toast with gravadlax, and eggs benedict on brioche. The normal bistro menu is also available from 12 noon all weekend. The 25 cover bistro, with additional seating for 10 on the east-facing terrace features exposed brick walls, antique French pendant lights, intimate booths and a beautiful black and white tiled bar top which come together to create a warm and informal environment.